How ready is Triple-A catcher Kevin Plawecki to replace Travis d'Arnaud? 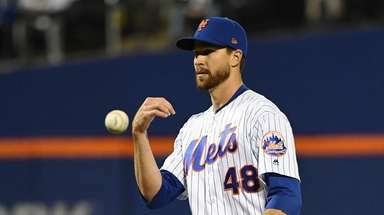 "That's tough for me to answer," manager Terry Collins said Sunday after d'Arnaud suffered a fractured right pinkie when he was hit by a pitch. "Off what I saw in spring training, I thought he was going to be a very good player. I thought he handled himself very well behind the plate. Everybody that's been around him thinks he's going to hit. "So can he handle it here? We'll most likely find out." The Mets take an eight-game winning streak into Tuesday's game against the Braves. Matt Harvey said the team does not intend to let its hot start be derailed by injuries. "We're definitely happy about eight in a row," he said. "We can't let the things that happen in baseball get in our way." D'Arnaud, who was placed on the 15-day disabled list, will be re-examined in three weeks. Lefthander Jerry Blevins, who joined d'Arnaud on the disabled list with a fracture in his left forearm after being hit by a line drive, will be re-evaluated in six weeks. Righthanded reliever Hansel Robles also was called up. D'Arnaud was hitting .317 with a team-leading 10 RBIs. Plawecki was batting .216 with no home runs and six RBIs in Triple-A but is projected to develop some power and has a triple and two doubles this season. General manager Sandy Alderson said he does not foresee going outside the organization for another catcher. "Right now, we're comfortable with what we have," he said. "You're never happy with an injury but we're fortunate we have somebody the caliber of Plawecki in the system. You're not going to find a guy like that in the market . . . We have all the confidence in the world he'll do a nice job for us." Last season in the minors, Plawecki threw out 23 percent of would-be base-stealers, but only 3 of 29 at the Triple-A level. He had thrown out 16 of 52 for Double-A Binghamton. Plawecki competed in spring training with veteran backup Anthony Recker, whose long-ball ability won him the job. Recker hit seven home runs in 58 games in 2014 and threw out 37 percent of potential base- stealers, which ranked him 10th in the National League. Recker, 31, is hitless in three official at-bats and has drawn four walks. "I definitely would want the opportunity" to play regularly, he said. "That's why I'm here. But at the same time, that's not my decision, so what's in my best interest is to make sure I'm ready every day where someone gets hurt or they call on me. Every day, I just have to be ready to go." Replacing Blevins, who did not allow a baserunner in seven appearances, could be problematic. "We've asked this guy to come in and face the best lefthanders in our division for sure," Collins said. "He's done a tremendous job." Robles, 24, has not allowed a run in 7 2/3 innings for Las Vegas, but as a righty, he does not address the need for a reliever who can retire tough lefthanded batters. Collins said he expects an expanded role for Alex Torres, who up to now has been known to fans mainly for his oversized protective cap. He allowed two runs to the Nationals on April 9 but was not scored upon in four subsequent outings. Notes & quotes: Vic Black, on the DL with a shoulder injury, was diagnosed with a small right side disc herniation, which the Mets said represented improvement since his last exam. He will be rechecked in a week. No timetable was announced for his return.